The circuit is based on a single junction FET Colpitts oscillator run from a 6volt regulated DC supply and using a 100uA miniature meter to indicate the gate current. The construction uses a single sided PC board to hold all of the electronic components including the Polyvaricon tuning capacitor and pins to connect to the inductor socket on the end of the case. Construction is not particularly critical except that the length of the leads and the stray capacitance in the tuned circuit must be kept as low as possible. The links are located in the base of each inductor and are omitted for all VHF ranges. Frequency coverage expressed as a ratio will be less with the links removed than with the links in place and will be dependant on the stray capacity of each individual PC layout - a single sided PCB is strongly recommended. The final value of R2 should be selected when construction is complete. Select R2 so that a reasonable amount of meter deflection is available on the highest frequency range - 82ohms is suggested as a starting value. Choke L3 should have low self capacitance. With R3 set to its maximum value, maximum meter deflection on the lowest frequency range should be around 50% of full scale. The coils are wound on a plastic or similar insulating tube of approximately 5/8" (0.625") outer diameter which can be fixed onto a circular 5pin DIN plug by removing some of the inner plastic material with a drill or scalpel and then using Araldite or a similar adhesive. The length of the former and number of turns will depend on the users frequency requirements. To minimise stray capacity around the DIN socket it can be mounted on a rectangular piece of plastic sheet which is itself mounted on the end of the case but with a larger hole than for just the DIN socket. The case is not critical and may be a die cast (BIM type 5004/14 or Eddystone type 27134PSL), aluminium sheet case or even made from PCB material soldered together on the inside and with some form of retained lid. The BIM box has increased internal depth compared to other die cast boxes which eases the mounting problems of the edge-wise meter and slow motion drive. If you decide not to use a slow motion drive then the Eddystone box is fine but requires a shallow edge-wise meter. The box should be painted on the outside with a primer followed by a colour of your choice and then labelled. 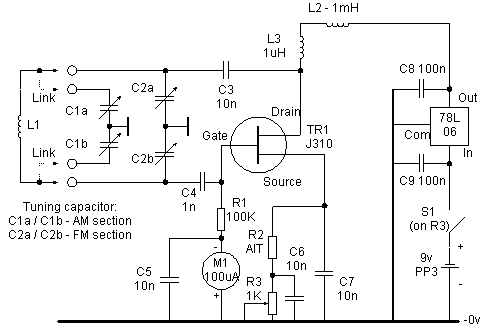 The regulator IC should ideally be a low drop out (LDO) type to maximise battery life. Type 78L06 is fine for supplies of 9 - 15v but has a fairly high minimum voltage drop so an LDO type is preferred for supplies below 9v. There are a number of related articles in the Electronic Design Centre on the site that will help with construction of the case, dial and PC board. A number of these GDOs have now been made in the club and the reliable frequency range should be 1 - 200MHz with the appropriate number of coils. Below 1MHz, the oscillator become less reliable and a number of component value changes will become necessary. This has not been pursued any further. Future improvements: Attention will be given to extending the frequency coverage although this may not be possible in a single oscillator because of the construction of the tuning capacitor.